Telecommunications networks are hierarchy organization. House and commerce access is based on wireless and wireline, wireless networks include 2G, 3G, 4G and WiFi, and wireline technologies are those fiber point-to-point (P2P), point-to-multipoint passive optical networks (PONs), copper twisted pair, HFC (hybrid fiber coaxial) technologies. Passive optical networks are the basis of Optical Access Networks (OANs) as defined in ITU-T Recommendation G.902, and also of hybrid fiber coaxial networks. PONs are often configured in tree or bus structures. 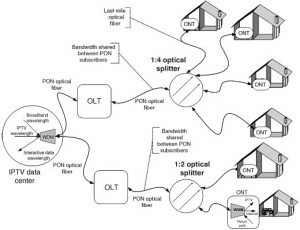 Feeder and distribution fibers, together with the distribution elements in the outside plant, are referred to as Optical Distribution Network (ODN). 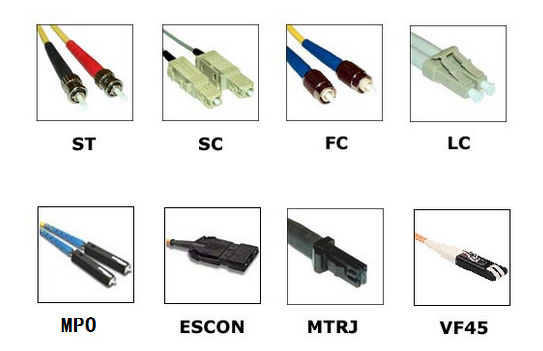 The different degrees of optical versus electrical access down to the customers for the different fiber-to-the-X(FTTX) access scenarios, where X stands for cabinet (Cab), curb (C), building (B), or home (H). The reference points for the OAN are the service network interface (SNI) and the user network interface (UNI). They are defined in ITU-T Recommendation G.983. The network architecture used to build a PON based FTTx network will typically comply with international standards. The main PON components include just like, OLT which its full name is Optical line termination and service provider head end in CO, and Remote node just called RN , it mostly passive, containing splitter/combiner or filter, for example, in cabinets, then ONU, it is optical network unit where at customer premises (CP), or in cabinet, etc. AG.983 compliant PON typically consists of an optical line termination (OLT), which is located at the IPTV data center and a number of optical network terminals (ONTs), which are installed at the end users premises. Note that ONTs May also be installed at different neighborhoods where the optical fiber terminates. In these situations, high speed copper data transfer technologies such as DSL are used to carry the IPTV signals into the end-users’ household. 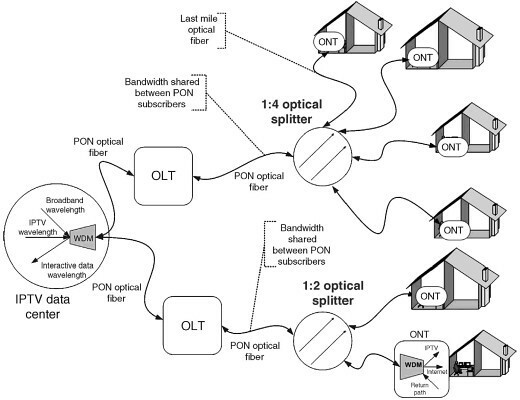 The OLT uses components such as fiber cable and optical splitters to route network traffic to the ONTs. Fiber cable, the OLT and the various ONT’s are interconnected by fiber optic cabling. With few transmission losses, low interference, and high bandwidth potential, optical fiber is an almost ideal transmission medium. The core of the fiber optic cable is made of glass and carries data in the form of light wave signals. The diameter of the fiber cable is relatively small and is designed to allow network engineers splice the cable at various locations along the physical route. The purity of today’s glass fiber, combined with improved system electronics in the cable, permits the transmission of high speed services over long distances. In fact, the G.983 standard allows the PON to carry digitized light signals up to a maximum distance of 20 km without amplification. Optical splitters, the optical splitter are used to split a single optical signal into multiple signals. It achieves this function while not altering the state of the signal; in other words, it does not convert it to electrical pulses. Optical splitters are also used to merge multiple optical signals back into a single optical. These splitters allow up to 32 households to share the FTTx network bandwidth and are typically housed in accessible mechanical closures. In PONs, several customers are connected to a central office or local exchange via a passive fiber-optic infrastructure. This infrastructure splits into single-mode fibers and passive splitting components (power splitters/combiners and/or WDM filters). PONs work bidirectionally on single fibers, in almost all cases, by using different wavelengths for upstream (US) and downstream (DS). Fiber cable and optical splitters are “passive” optical components. The use of passive components to guide the light waves through the network eliminates the need for remote powering, which cuts down on operational and maintenance costs. The main purpose of the ONT is to provide IPTV subscribers with an interface to the PON. It receives traffic in optical format, examines the address contained within the network packets, and converts it into electrical signals. The ONT can be located inside or outside the residence, and is typically powered from a local source, and include bypass circuitry that allows the phone to operate normally in the event of a power failure. The majority of ONTs will include an Ethernet interface for data traffic, an RJ-11 connection for connecting into the home phone system, and a coaxial interface to provide connectivity to the TV. The ONT is also responsible for converting data into optical signals for transmission over the PON. active optical networks (AON) makes use of electrical components between the IPTV end user and the data center. In particular, the AON networking architecture utilizes Ethernet switches that reside between the IPTV data center and the endpoint of the fiber network. For example, a single piece of optical fiber is run from the backend office to an optical splitter, which is typically located in close proximity to the subscriber’s house. The bandwidth on this fiber is typically shared and is capable of supporting high bandwidth capacities ranging from 622 Mbps all the way up to several gigabytes of data per second. In addition to the physical components of a PON also illustrates the transmission of three different light wavelengths (channels) over the network. The first wavelength is used to carry high speed Internet traffic. The second wavelength is allocated to carry IO video services and the third wavelength may be used to carry interactive traffic from the subscriber’s home network back to the service provider’s backend equipment. Specialized FTTX filters called wavelength division multiplexers (WDMs) are installed at the data center and inside the OLT that allow a PON to support the transmission of multiple parallel channels or wavelengths on the one piece of fiber. Thus, creating a number of virtual fiber channels over a single fiber pair. Under WDM, the capacity of the network is increased by assigning signals that originate from optical sources to specific wavelengths on the optical transmission spectrum.